The Bangalore leg of the European Art of Taste (EAT) program has just concluded. As EAT’s Bangalore consultant, I had the pleasure of helping to put together a series of food-focused events. The first, at Caperberry, was an art-themed event that explored the connection between art and food. Art historian Annapurna Garimella presented several great works of art that featured food – and chef Abhijit Saha created an extraordinary menu consisting of dishes (a choice of vegetarian or non-vegetarian for each course) inspired by the art. I’m one of those people who believe in cooking as a science. That said, I’ve a lot of respect for the artistry involved – the creativity required to experiment with textures, flavors, and colors; the beauty of a well-presented meal; and the concept of the plate as a blank canvas. This one is thanks to my best friend Melanie Coelho, who brought these amazing works of art to my notice. If you’re someone who thinks kids ought not to play with their food, take a look at these, and rethink your stance. 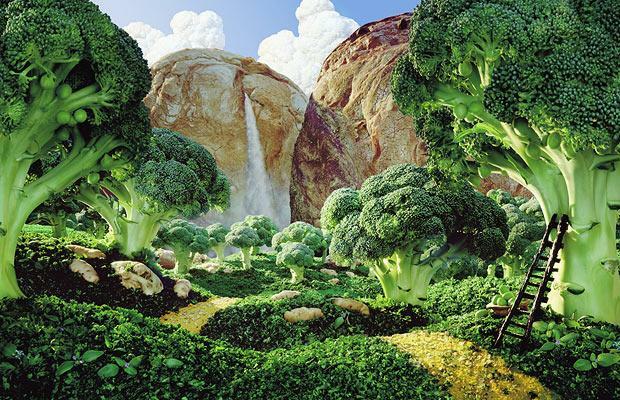 Every element in each of these five images is crafted from food. Do click on the pics for a closer view.